The president's budget proposal for fiscal year 2019, released today, proposes massive cuts across nearly the entire federal government. The budget calls for $120 billion in spending cuts compared to the budget deal negotiated by Congress and signed by the president just days ago. Out of twelve major federal spending categories, only the military and veteran's benefits would be spared from the Trump cuts. 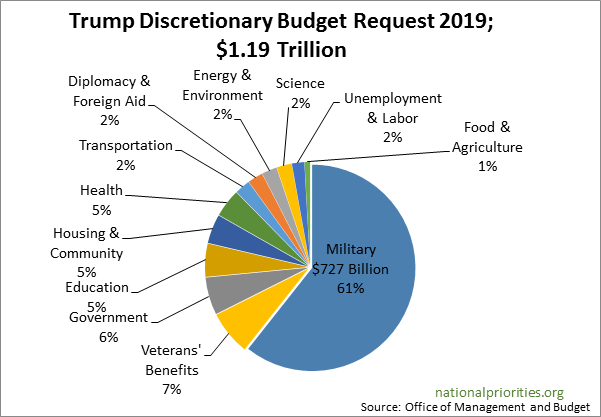 The military budget is in line with what Congress passed last week, and amounts to a roughly 10 percent increase in military spending. For more on the budget cuts and comparisons to the budget deal, see our preliminary analysis here.